Melody Shantala Sacco loves to express her artistic attitude in different creative ways. She has a diploma in visual art and attended Brera Art Academy in Milan, Italy and in the UK she trained extensively at the London School of Face painting and then founded her own company Improface. Face & body painting is a celebration of her passion for visual art and a place where she can apply her artistic skills in a professional way. Her greatest loves are the use of color and the magic of transformation when watching the joyful surprise as a child looks at their new face in the mirror. She enjoys working with children, adults and performers bringing them all into a playful world. 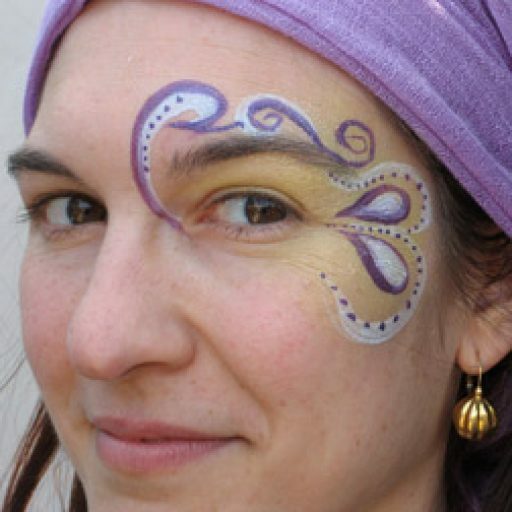 Melody has been working as a professional face painter in London, Barcelona and Vienna, in diverse settings from private birthday parties and company celebrations to large public events. She also worked one to one as body painter for private artists, performers and pregnant mothers. Private party and event all over London. Crafty Fox Market at the Thames Festival. St. Mary’s School Faire, Hampstead London. Courtney Orange, Mitcham United FC, London. Greek National Tourist Organization, London – Westfield Shopping Center. Beach by the Thames festival. Southbank, London. Rainforest Foundation, Finsbury Park London. May Faire and Puppet Festival, Covent Garden. Butterfield Green Fair, Stoke Newington. Airside design company, Party at Platinum Club, London. Pirate’s day, Golden Hind SE1 London.